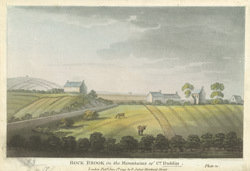 View of the village of Rockbrook in the foothills of the Dublin Mountains in Ireland. The village developed in the 18th century to accommodate the employees of the various paper and flour mills that had grown up in the area. It has been suggested that the name Rockbrook is derived from a reference to the rocky bed of the river Owen Dugher which runs close by.